Its Hay season here in farm country. From mid-August through September, the tall prairie grass is cut, raked, then baled to provide livestock feed through the winter. In this area, it’s the sweet, tall, highly nutritious Bluestem grass of the Kansas Flint Hills that’s being harvested. Compressing the cut grass into a large tightly wound shape serves to preserve the grass’ nutritional value. The outer layer decays a couple inches but serves to insulate the rest of the bale. Thus, the grass holds up far longer than it would if cut and left loose. It’s only been in my adult lifetime that the large round bales came in to use. Previously, hay was bales into small square bales of about thirty-five pounds each. A lot of physical labor was used to move the bales from bailing machine to feed. Now, weighing a thousand pounds per bale, they are impossible for humans to handle so machinery is a must. In one way it’s a shame that our youth don’t have such a body developing activity anymore. But as one who has thrown a bale or two, I don’t miss the old bales a bit. The large round baling machine itself is a Kansas invention. Mr. Lyle Yost, founder of Hesston Corp. in Hesston, Kansas was the inventor and brought them to the market in the early 1970s. Now they are the standard of the world. “August Hay 2003” was taken early in my Large Format experience using 4×5 Kodak Tri-X film. The print was made on Forte Polywamtone fiber base paper. No one that I’ve talked to knows much about the The Old Stone Fort. Located in southwestern Wabaunsee County, Kansas, this old building sits atop a small hill overlooking the old Trail Drover’s Road and a stream crossing. 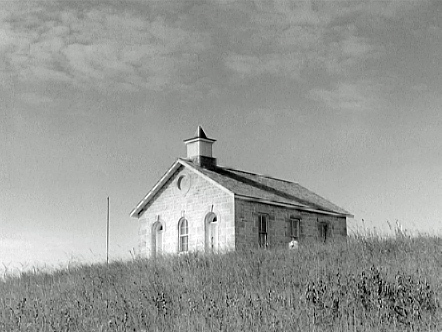 Privately owned, it serves as a convenient place to feed cattle who are grazing on the rich Flint Hills grass. Going west from Volland on Old K-10, find Trail Drovers Road on the right and follow it for a few miles. You should some to the Old Stone Fort. My guess is that originally this was a Cavalry outpost for Fort Riley. There is also a stable, just to the left of where I was standing. 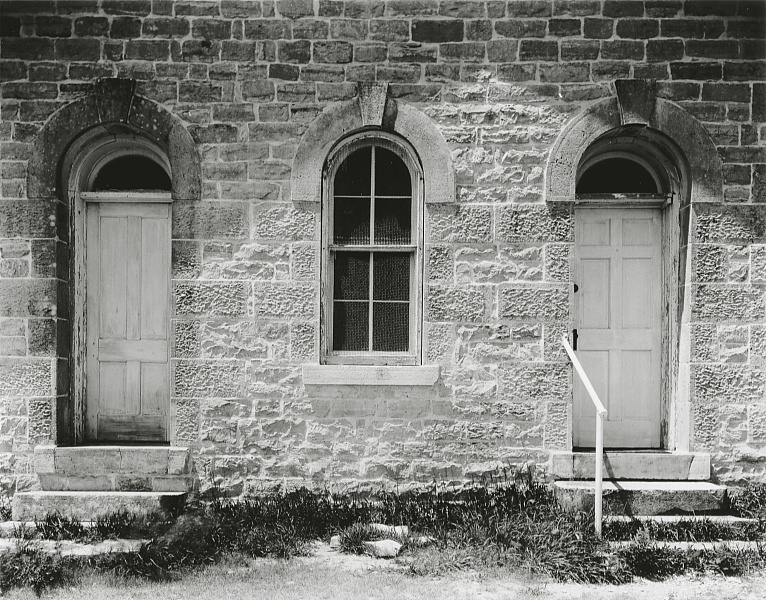 Both buildings were not built for ranch or farm service; they don’t appear to have had the amenities for permanent occupancy of either humans or livestock. The location makes sense as a good place to station a detachment of Horse Soldiers. Trail Drover’s Road was the main cattle trail in the area for driving the herds to the railroad, some six miles away at Volland. The nearby stream crossing was probably important for the cattle drives too. And, the stream could supply water for the men and horses stationed there. All this is just my rank speculation of course. The negative for Old Stone Fort was taken on 4×5 Polaroid Type 55 sheet film. I loved that film! One more sigh for its demise. Prints of the Old Stone Fort are available for sale through my APUG Portfolio. Please contact me via e-mail or a Blog comment if you are interested. This may be the obligatory Polaroid Type 55 cow skull photo. Seems everyone does one but that’s not why I did it. Both elements shown came from the backyard; the wood (which is a walkway I built years ago) from my yard, the skull is from the neighbor’s. 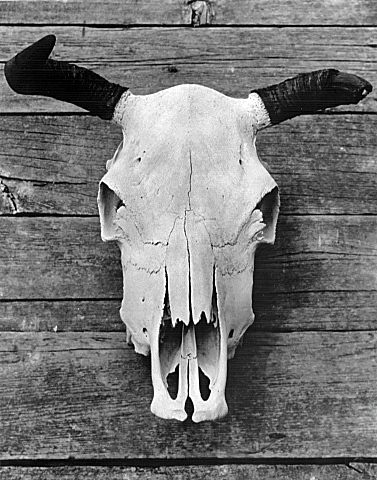 The skull is an authentic Kansas Flint Hills cattle skull. Those of us that used Polaroid Type 55 film have been crying our eyes out ever since Polaroid’s demise earlier this year. I bought five boxes and swore I was going to put it to good use. A final fling I suppose. Gearhead info: 8×10 Deardorff field camera with 4×5 reducing back. Schneider 305 mm G-Claron lens, Polaroid 545 film holder, and Polaroid Type 55 positive/negative film. 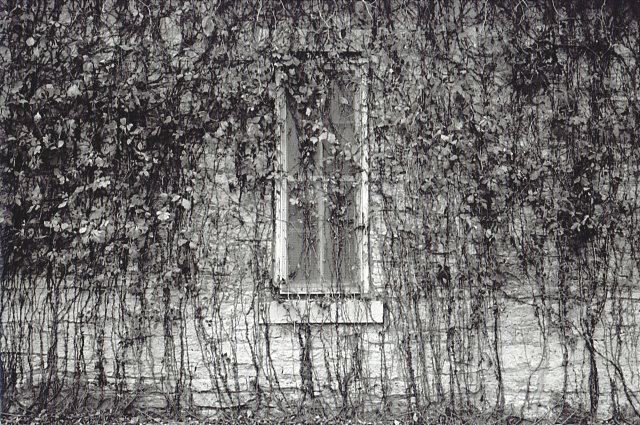 This scan was made from an 8×10 enlarged print on Kentmere Kentona fiber paper.